At six-feet-nine-and-a- half- inches tall and with a kind smile and easy manner, Vincent is the gentlest of giants. 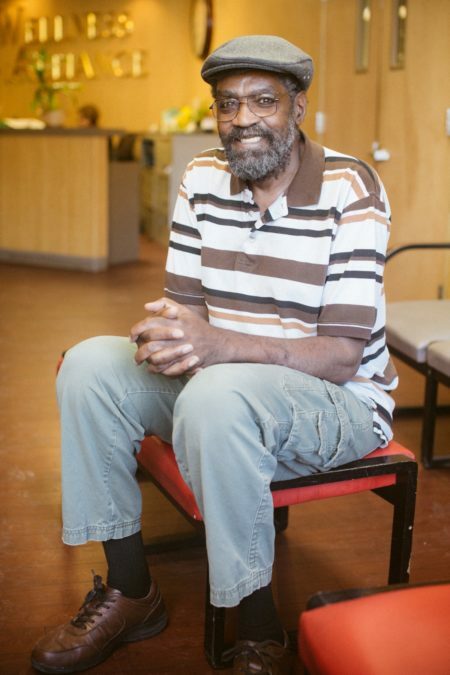 As healthy and robust as he looks and feels these days, Vincent was certainly not quite as well when he first made his way to Horizon House. Decades of struggling with mental illness and not enough support had left Vincent depressed, isolated, and in need of serious medical attention. Vincent was born in Reading, PA and lived there until the age of 11 when his father died and his mother moved him and his siblings to Philadelphia. A gifted basketball player throughout high school, Vincent received a college scholarship to play and he chose to major in psychology. Vincent’s promising college career was derailed just prior to his senior year when he was suddenly overcome by a debilitating depression. Vincent spent some time in the hospital and several years ago wound up homeless and out of touch with his family. Because of memory lapses, it was challenging to piece together Vincent’s life before he came to Horizon House. But once he got the help he needed, tracking his incredible progress has been easy. As his case manager, Barbara helps to organize Vincent’s care. She works to make sure that Vincent’s various health needs are met by coordinating with the other case managers and with the agency’s Project HEALTH program, which teaches people about health and wellness and offers support as people begin to take responsibility for their physical health. With Barbara’s encouragement, Vincent has been practicing taking public transportation so that he will soon be comfortable enough to travel to his appointments on his own. Vincent has been living in a personal care boarding home with ten other adults. He enjoys watching basketball and reading—mostly on psychology and philosophy. Sometimes he will share his personal insights with others. Although some days are better than others, Vincent feels that his life is finally under control. Where once he would isolate himself from others, today, he is comfortable establishing friendships. You are likely to find him out for a stroll with friends in his neighborhood or happily playing a card game called Pitty Pat. He acknowledges the help he has received from Horizon House that has turned his life around.